Clipstone staged a sensational second half fightback to beat visiting Louth Town 4-2 to keep up the pressure at the top of the Northern Counties East League Division One on Saturday. The Cobras are in fifth place, but are only five points behind leaders AFC Emley with four games in hand. Clipstone v Louth. 'Clipstone's captain, Ash Rawson in the thick of it. In midweek Clipstone had clinched their first Notts FA Senior Cup final place in 12 years. But a very under par first half performance against Louth four days later would not have pleased manager Chris Millington as his side trailed 2-0 with just 18 minutes on the clock, and were lucky not to be 4-0 down by the interval. Whatever was said during that half-time break can’t have been pleasant for the players to hear, but it worked as they roared back with four unanswered goals. Louth were in control of the first half of the game from the very first whistle. Clipstone must have thought they had walked into a time warp, sending them back several weeks to when they lost their way for a few games. Louth’s Steve Norton and Jamie Coulson were a persistent thorn in the Cobras’ side. On nine minutes the deadlock was broken. Clipstone’s Chris Baugh was caught out in the right back position, and even though he tried to make amends, he could not stop the cross coming in front of goal where Norton had the finishing touch from a yard out. Clipstone’s passing was woeful in that first 20 minutes of play, relying on individual runs to break down the visitors’ defence, though Dan Wood’s 30-yard effort did make Louth keeper Scott Drury save well low to his right and tip the ball out for a corner. 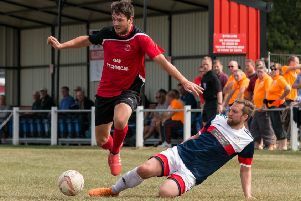 Rob Paling was swinging the ball into the right areas, but the Clipstone attackers were not making the correct runs and the danger was being cleared. Just three minutes later and Clipstone’s woes had doubled. Another mix-up in the hosts’ defence let Norton pass across the face of goal and Coulson reacted the quickest to tap in from two yards out. On 28 minutes Louth should have been3-0 up. Rob Paling tried to play his way out of trouble and was dispossessed 25 yards out on the left. Louth’s Jordan Smith laid the ball on a plate for Coulson who somehow managed to fire high and several yards over the crossbar from just two yards out. Clipstone were looking shellshocked, lacking inspiration and motivation. They did not have another decent attack until just before half-time when Matty Ord’s shot from 22 yards out was parried to safety by Drury. If the first half was all Louth then the second half was grabbed by Clipstone. They came out for the second period all guns blazing and everything they touched turned to gold. On 49 minutes Wood received a pass from Ash Rawson and very cleverly hit the ball beyond his marker, Rocky Rawlings, who then blocked Wood’s path through an obstruction. Rawlings was cautioned and an indirect free kick awarded just inside the Louth half. Paling hit a ball to the edge of the six yard area which was only half-cleared into the path of captain Rawson who, with a half volley, smashed the ball beyond the despairing dive of Drury to half the deficit and bring the Cobras onto the scoresheet. This really brought the confidence out in Clipstone and within a minute they were back on level terms. Ord teased the Louth defenders all ends up and played a one-two with Callum Mawby before tricking his way past two more defenders, eventually getting a shot away which was deflected to the very grateful Ryan Damms, who does not miss from five yards. It was a real turnabout and Louth were like rabbits staring into bright lights. And when Ord ran onto a Josh Gibson pass he found himself in a chase with the keeper, Ord winning the race and also a penalty after Drury sent him flying. Luckily for the keeper Ord was not running directly at goal or he could have seen more than a yellow card from referee Mr Royston. Paling took the honour of converting and putting Clipstone into the lead. Clipstone were rampant, throughout the second half. Louth were seeing stars in their eyes and when Ryan Damms turned and fired goalwards, Drury was happy to see the ball hit the sidenetting. Jamie Smith replaced Gibson on 68 minutes. It wasn’t until the 80th minute that Louth made further inroads in the Clipstone half. They were awarded a direct free kick when Rawson was a little late with a challenge. Jordan Smith tried his luck and fired one at goal, Clipstone keeper Nick Siddons spilled it and was relieved to see Karl Colley sliding at the far post to clear the ball before it had crossed the line. On 85 minutes Louth’s keeper Drury made a right mess of a goal kick, slipping as he struck the ball direct to the feet of Smith 40 yards out from goal. Smith took one touch to control and another to fire towards the top left corner of goal, Drury making up for his mistake, grabbing the ball at the last second. This only made Smith more hungry for a goal, and on 90 minutes he received a pass from Paling 25 yards out from goal. turned and rifled a shot away, beating the keeper for pace and at the near post to end any chance that Louth may have thought they had of scraping anything from this game. CLIPSTONE MAN OF THE MATCH: Matty Ord.